Tanzanite: Mineral information, data and localities. 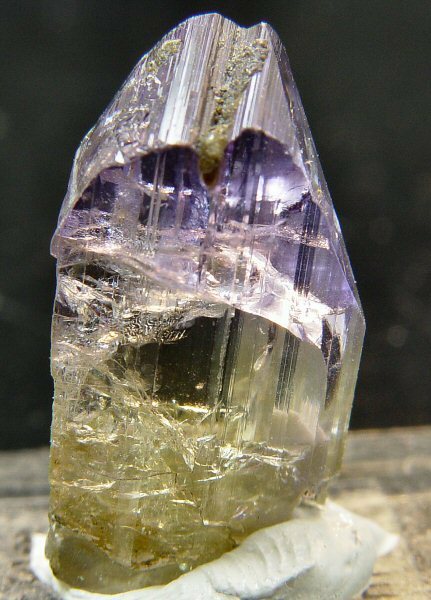 A gem variety of zoisite with a blue to blue-violet colour. The colour is due to the incorporation of trace amounts of vanadium cations (V4+ absorption band increased at 380 nm, V3+ absorption band at 350nm decreased with heating). 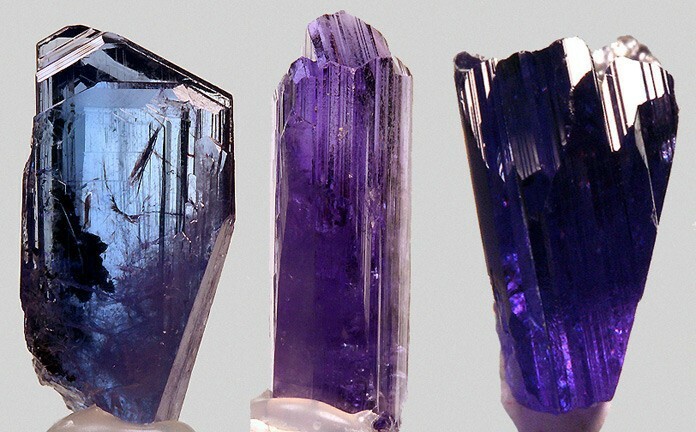 Note that a significant percentage of tanzanite crystals on the market have been heat-treated (400-500°C) to produce or enhance this colour, many are originally brown or pale grey (Hurlbut 1969; see photo to the right). A red tint seen looking down the c-axis is a good indication that the crystal colouration is natural. Note also that tanzanion is used as a synthetic simulant for tanzanite. 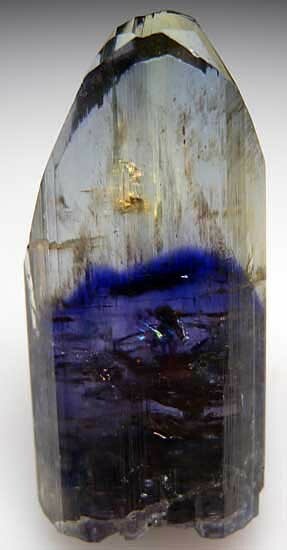 Natural and heat-treated tanzanite is strongly pleochroic (Hurlbut 1969). The photo to the right shows a single crystal viewed from different directions. First reported from the Merelani Hills (Mererani), Tanzania. Visit gemdat.org for gemological information about Tanzanite. Graphite 30 photos of Tanzanite associated with Graphite on mindat.org. Prehnite 23 photos of Tanzanite associated with Prehnite on mindat.org. Chabazite 12 photos of Tanzanite associated with Chabazite on mindat.org. Calcite 9 photos of Tanzanite associated with Calcite on mindat.org. Quartz 9 photos of Tanzanite associated with Quartz on mindat.org. Pyrite 8 photos of Tanzanite associated with Pyrite on mindat.org. Stilbite subgroup 8 photos of Tanzanite associated with Stilbite subgroup on mindat.org. Laumontite 7 photos of Tanzanite associated with Laumontite on mindat.org. Fluorite 5 photos of Tanzanite associated with Fluorite on mindat.org. Diopside 5 photos of Tanzanite associated with Diopside on mindat.org. Hurlbut, C.S., Jr. (1969) Gem zoisite from Tanzania. American Mineralogist, 54, 702-709. Faye and Nickel (1971): Can. Mineral., 10, 812-821. Guebelin, E. and Weibel, M. (1976): Neuer Untersuchungen am blauen Zoisit (Tanzanit). Z. dt Gemmol. Ges., 25, 23. Wilson, W.E., Saul, J.M. Pardieu, V. & Hughes R.W. (2009) Famous Mineral Localities. The Merelani Tanzanite Mines, Lelatema Mountains, Arusha Region, Tanzania. Mineralogical Record, 40, 347-408. Harris, C., Hlongwane, W., Gule. 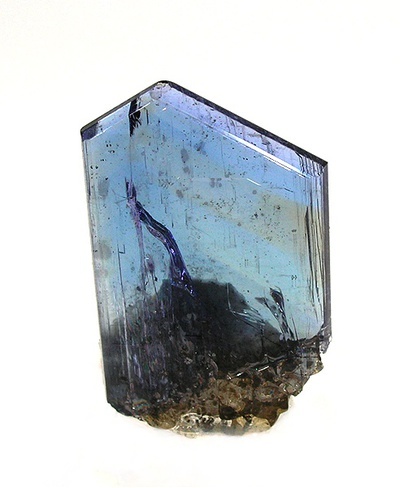 N. and Scheepers, R. (2014): Origin of tanzanite and associated gemstone mineralization at Merelani, Tanzania. South African Journal of Geology, 117, 15-30. Pimthong Thongnopkun, Phet-Anong Chanwanitsakun (2018) Color improvement using heat treatment and characteristic spectra of brownish yellow zoisite. in abstracts of the 22nd IMA Meeting Melbourne p 518. The following Tanzanite specimens are currently listed for sale on minfind.com. Wilson, W.E., Saul, J.M. Pardieu, V. & Hughes R.W. (2009): Famous Mineral Localities. The Merelani Tanzanite Mines, Lelatema Mountains, Arusha Region, Tanzania. Mineralogical Record, 40: 347-408. Olivier, Bernard (2008): The geology and petrology of the Merelani tanzanite deposit, NE Tanzania. Doctoral thesis, University of Stellenbosch, South Africa. Natural HistoryMuseum of Los Angeles Co.specimen catalogue No. 41249.